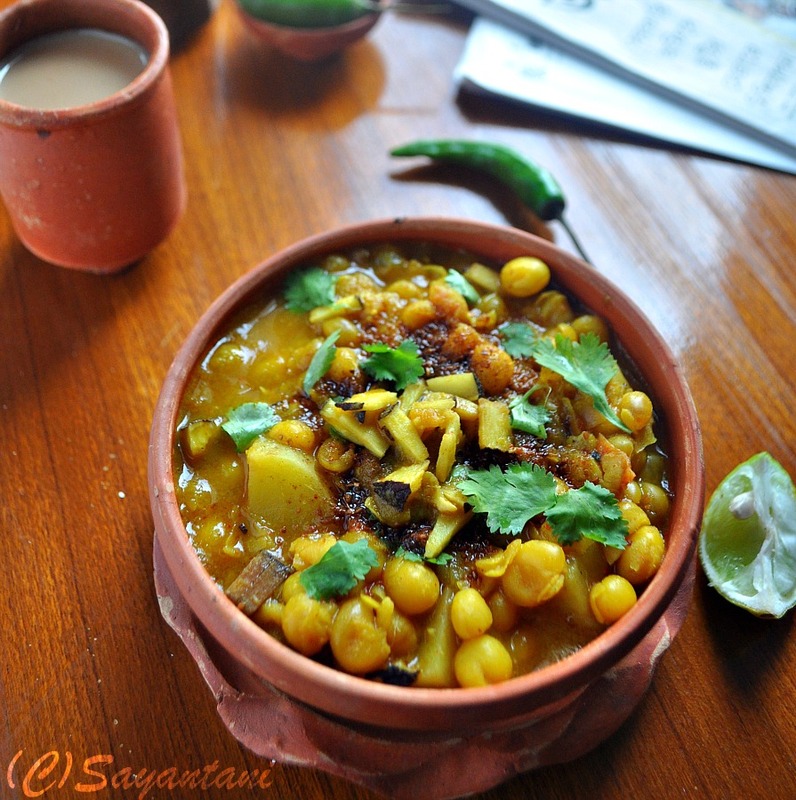 Ghugni or ghuguni is a very popular snack in Bengal, Orissa, Assam and Bihar. 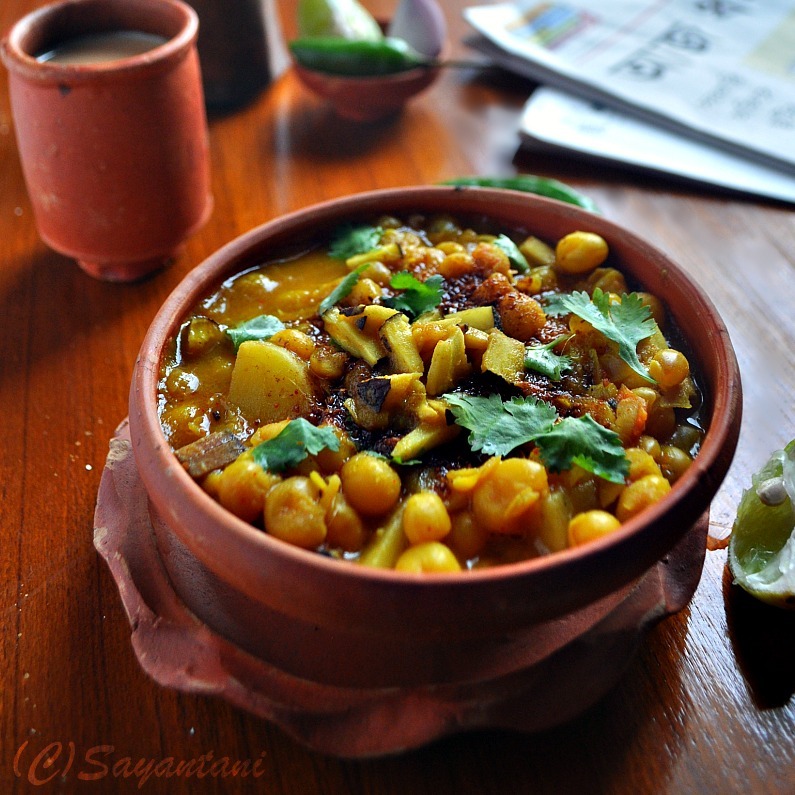 There are many versions of ghugni but the basic recipe is to cook boiled yellow peas with common Indian spice mix i.e. onion-ginger-tomato. 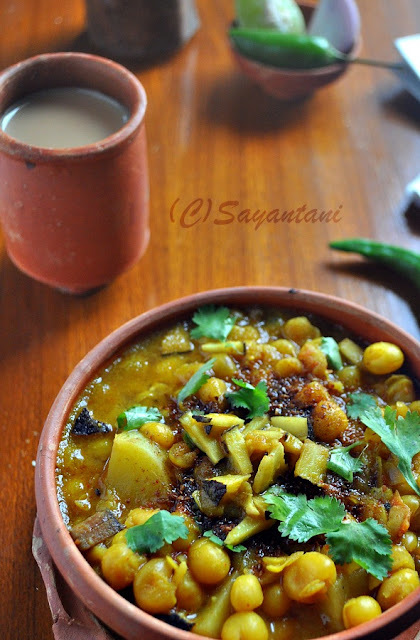 In my initial days of blogging I had shared one healthy recipe of ghugni but what I dint understand then was before doling out the healthier version one needs to share the basic recipe first. I haven’t changed much yet and today what I am sharing again is the pure vegetarian version (sans onion-garlic) of it. The basic version most probably will have to wait for another year or so. In meantime you can go and check the stories I shared THERE. 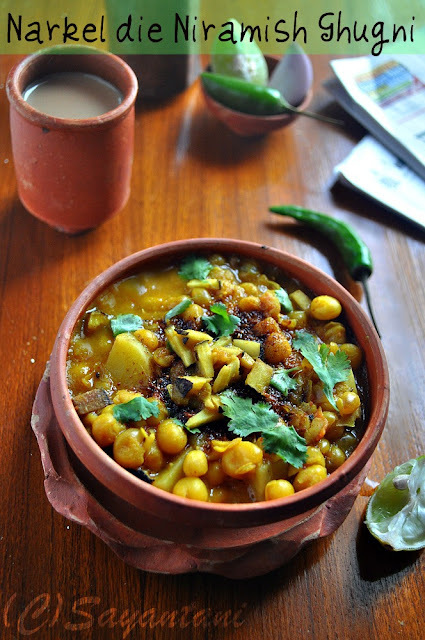 We Bengalis have a peculiar habit of cooking a pure vegetarian version of all our favourite dishes. In our quest for doing so we even have many vegetarian versions of goat meat, fish and vegetables. Which we first offer to God and enjoy there after. This no onion-garlic ghugni recipe is also meant for the puja days. Which is often served with soft-puffy luchis for breakfast. Yes this is another great combinations after luchi-alu’r charchari that Bengalis die for. 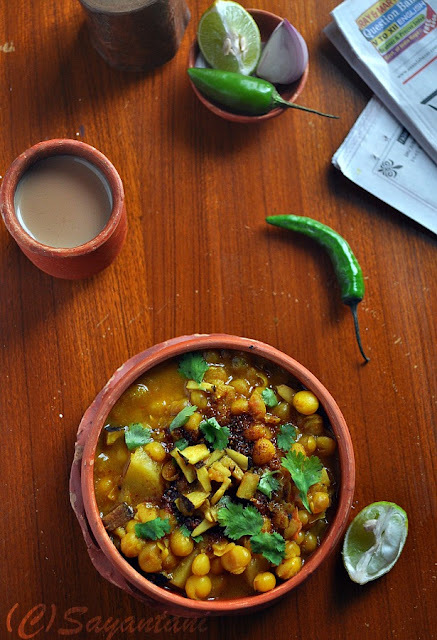 If on a sleepy morning you travel by the suburbs and look for some breakfast options, most probably you will find this in the roadside tea shops either to go with puffed rice or toasted white bread. People like my Hubby or my elder brother say that’s the best breakfast one could have. Am yet to agree with them as I just cant stand that mush of yellow peas and cubed potatoes, thickened with flour and topped with everything they can think of. I much prefer the homemade ones where the peas still retain their shape and beautifully soaks all the flavours and spices. For me Maa makes the best ghugni in this world and I guess many of my friends will agree with me on this. Still people mention how they loved the ghugni Maa used to serve (she still does but her daughter’s friends are way to busy to drop in now a days) on holi or rakhi. Those days are gone but memories and tastes linger on in our hearts. To boil the peas it needs to be soaked at least for 3-4 hours. Then pressure cook the peas with salt and turmeric on medium flame for 2 whistles. Let the steam escape on its own then open the lid. The peas should be cooked through but not mushy. Here I must say that the cooking time depends on the quality of the peas. If you are doing this for the first time then start by cooking it only for one whistle. Let the steam escape and check. If it's undercooked then you can cook it further and this way you will get the idea. Peel the potato, wash and cut in small (1/2”) cubes. Keep aside. Mix the ginger paste, cumin- coriander powder, chilli powder with ¼ cup water. Mix and keep aside. Heat the oil in a kadhai or a big pan. Fry the chopped coconut pieces till golden. Drain and keep aside. In the same oil add the whole clove, cinnamon, bay leaf. Once they splutter add the slited green chili and cumin seeds. When the aroma rises add the cubed potatoes and pinch of salt. Fry till the potatoes are light brown in colour. Pour in the mixed spices and keep frying on low for couple of minutes. The oil will start to separate at the sides. Add the boiled peas and turmeric in it and mix thoroughly. Check the seasoning and let it come to a boil, then add the fried coconut pieces. Add more water if needed. The end dish should have thick gravy, so adjust the water accordingly. Once the peas soak the flavours and the potatoes are cooked add the sugar and adjust the seasoning. Sprinkle the garam masala powder and mix. Serve with lemon wedges, black salt and bhaja masala. I love my coconut ghugni as it is with hot masala tea. But as I mentioned earlier it could be served with roti, toasted bread, luchi, paratha or puffed rice. Donot over boil the peas as this will ruin the texture and taste of the Ghugni. Similarly fresh green peas could be cooked. Though you do not have to pressure cook that. Just add fresh peas in the spice mix and cook. Sending this to Susan's MLLA# 45 hosted this month at girlchef. Food Corner's hot and spicy treats. For you Mum at Nupur's UK Rasoi. Vardhini's love lock with legumes. @Turmeric, Oh my hubby was a part of this organisation too and every time I make this vegetarian version he says the same. ghughni r kotha shunleyee kolkatar borsha kaal mone pore...all time fav..
@Sarmistha, cha er cup ta oi tea junction thekei collect kara...ar matir bason gulo anyo akta bangali restaurant theke. 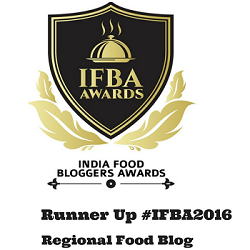 food blogger hoe ki jugaru hoe gechi boloto. I love it, especially back home! I guess It can be eaten all alone without any roti. Very different I love yellow peas and coconut is nice touch! @Cham I love it that way only. @Arch, yes this is very similar with Misal, I saw the recipe on the last issue of BBC Goodfood. we use a lot of coconut in our pure vegetarian dishes. 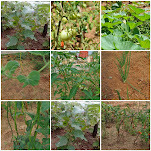 like we cook chana or mung dal with it and also many summer dishes like banana flower, bottle gourd curries etc. Oh..I did not know Gughni is popular in other states as well...except the coconut part looks like the recipe has many things in common. I thought its mainly from Rajasthan.. Would now like to cook your version and see the difference. @Sanjeeta, coconut is very common in our vegetarian dishes. we mostly cook dal or summer vegetables like bottle gourd or banana flowers with this. 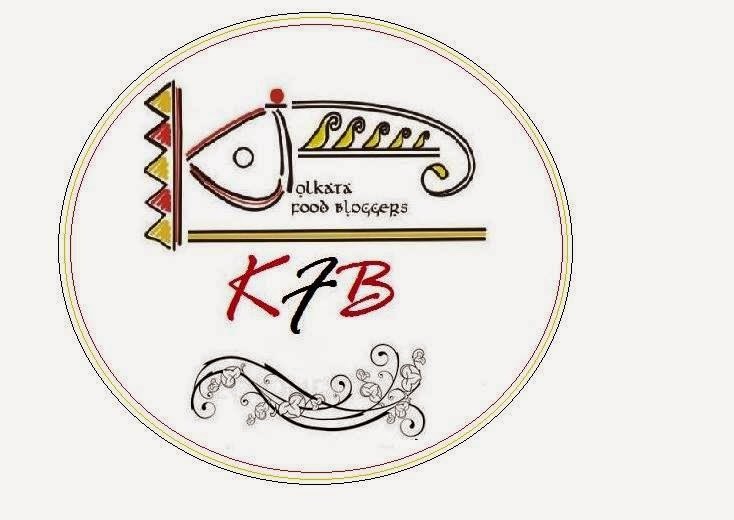 hi sayantani this si sulagna from pune, born and raised in jharkhand i now live in the land of vada pao..you blog cme as breather fo air because i absolutely love bengali food.khon ofc thike fire shomoy peleyi kichu experiment kori..ghughni has some very fond childhood memories attached ! curry looks delicious...perfect with roti..
Ghugni with coconut, this my kind of recipe. We have weakness to coconut. Looks delicious. Osadharon hoyechhe ghugni. Mangsh-er othoba narkel-er jebhabei banano hok it is a hot fab in any bong home..tai na? looks delicious n nice clicks!! @Preeti and Sanghamitra, you dont know how I managed to collect these posts and plates. My hubby threatens me saiing if I continue like this he will disown me. @Jagruti, i guess this is a Bengali speciality may be not that popular in Orissa. @Sulagna, thanks for your comment...love to know that you liked my blog. Ki shundor ghugni ta dekhte. Love the presentation. Tobe shaal pata te khete aaro moja lage na?! Very appealing and super nourishing dish !! Thanks for linking to the event!! New dish and the clicks are inviting. Thx for linking to the event. Thanks Tanusri for trying this out. soooo glad that you liked it.